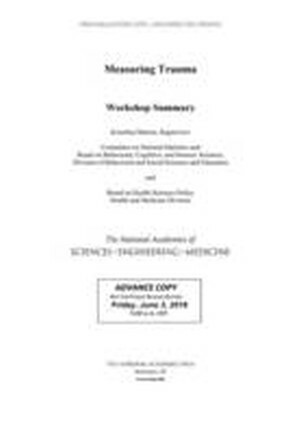 The Workshop on Integrating New Measures of Trauma into the Substance Abuse and Mental Health Services Administrationa (TM)s (SAMHSA) Data Collection Programs, held in Washington, D.C. in December 2015, was organized as part of an effort to assist SAMHSA and the Office of the Assistant Secretary for Planning and Evaluation of the U.S. Department of Health and Human Services in their responsibilities to expand the collection of behavioral health data to include measures of trauma. The main goals of the workshop were to discuss options for collecting data and producing estimates on exposure to traumatic events and PTSD, including available measures and associated possible data collection mechanisms. This report summarizes the presentations and discussions from the workshop.